In a dream, Counsellor Deanna Troi senses the voices of a crew whose life-essences were somehow absorbed within a creature that destroyed their ship 300 years before. Now Picard must find a way to communicate with the creature - or the Enterprise crew will also be absorbed by the "ghost ship". 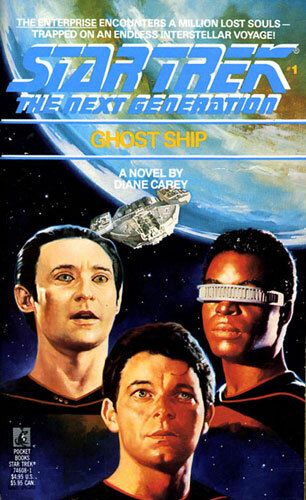 In the first regular novel based on Star Trek: The Next Generation, Diane Carey presents a story that successfully bridges the gap between the TV series' pilot episode and the remainder of season one by rounding off some of the changed premises. For a book that was likely written before the pilot was even transmitted, she does well to capture the locations and the characters from the series. The story is not focussed on a specific character, but is spread fairly evenly between about five, with decent appearances by the rest of the regulars. It's a strong sci-fi tale that draws on the characters' emotions to present a really enjoyable and interesting read that, unlike many tie-in books, presents characters learning and changing based on their experiences. The style of the book is slightly awkward though, with the narrative slipping into paragraphs of introspection from a number of characters' points of view, which tend to slow the story down and distract from what's really happening. This was particularly noticeable in the passages tied to Riker's viewpoint. Carey also seems in places to be making a dig at various aspects of the series, and it almost feels as if she's using the characters' thoughts to criticise some of the series' creators' decisions. The best thing though was the moral dilemma that the author poses to the Enterprise's crew. It's a really strong question that survives the test of time and remains authentic and challenging to the reader today, some 25 years after the novel was written. This more than makes up for the eighties references, particularly near the beginning, and also the attempts to tie the book into the previous Original Series novels with details that would later be contradicted by future TV show. Overall, much better than I had been expecting from the age of the story, and I can only hope that this is representative of the series at this point, rather than them choosing the best to carry the number one label, as I continue reading.